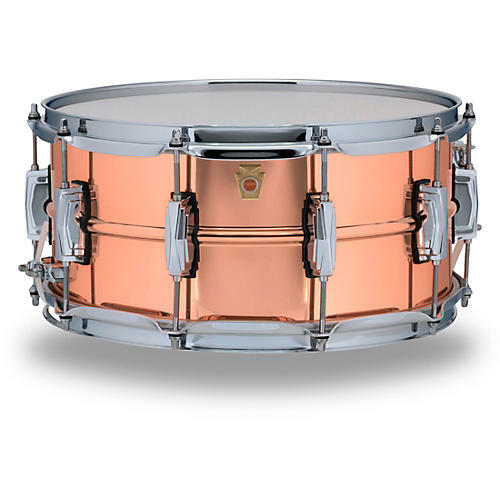 With close to century of experience building copper timpani, the newest member to the Ludwig USA snare drum range is the Copper Phonic Hammered snare drum. The first American-made Ludwig snare drum in 20 years offers a 1.2 mm hammered shell and produces warm tone, powerful attack and dry overtones. This drum is fitted with Imperial or tube lugs and 2.3 mm hoops Built to the same standards as Ludwig's Black Beauty, Supraphonic and Bronze Phonic models, the Copper Phonic is a legend in the making. Available in 14 x 5 in. and 14 x 6-1/2 in. sizes.